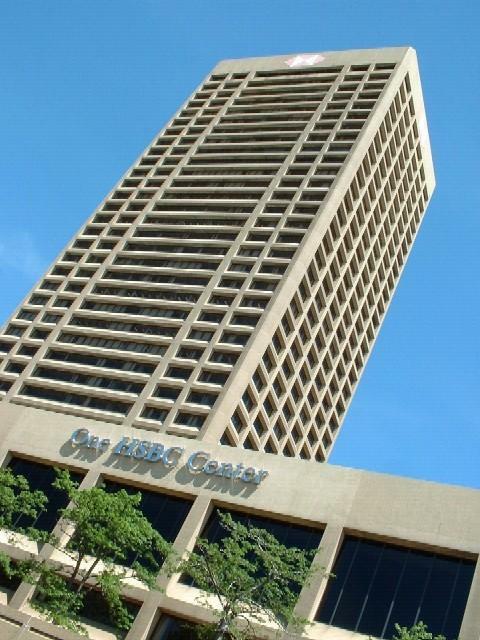 For the skyscraper in Rochester, New York, see One HSBC Plaza One HSBC Center is a skyscraper located in downtown Buffalo, New York. Formerly known as the Marine Midland Center, its name was changed when Marine Midland's parent company HSBC rebranded the bank as HSBC Bank USA. It was constructed at a cost of $50 million between 1969 and 1972, and contains over 1,200,000 square feet (111,000 m) of space. Today, the 40 story building still dominates the Buffalo skyline, at 529 feet (161 m), or 161 meters high. It is an example of modernist style architecture. One of the most interesting aspects of the building is that it spans the southern end of Main Street, under which the Buffalo Metro Rail passes. It is the tallest building between Cleveland and Albany. The plaza hosts Ronald Bladen's monumental, 1973 work titled "Vroom, Shhh." On a clear day, One HSBC Center can be seen from 20 miles (32 km) away along the New York State Thruway.